Caution(s): some people experience an allergic reaction to the strong aromatic oils in Western redcedar. 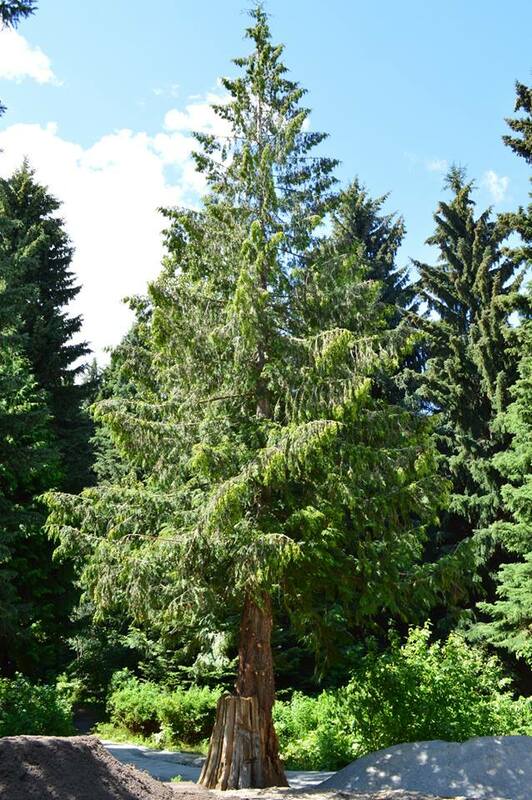 Botanical Description: Western redcedar is an evergreen, scale-leaved coniferous tree. At the top, cedar branches sit on a horizontal plane, but below its long withes curve downwards, slender branches that swoop down in tiers. 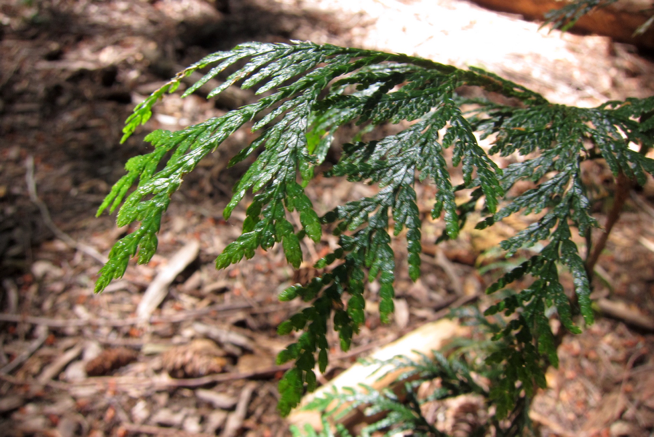 The inward curl cedar’s branches indicate that it is highly adapted to its wet, west coast environment. Cedar produces oblong cones that generally bear 4 rounded scales. 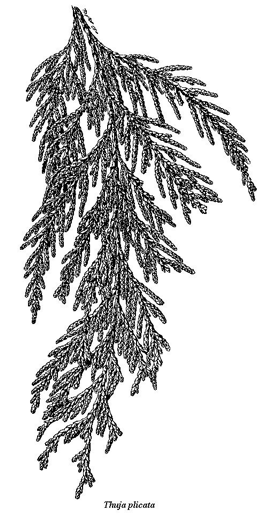 Current Distribution and Local Habitat(s): Redcedar is native to the Western North American Geographic range. It is partial to a cooler climate, favouring the low to mid-elevations on the BC coast and in the Rocky Mountain Trench. It can grow up to 60 m tall and the base can often grow up to 8m in width. Ethnobotanial Application(s): Redcedar was an important element in both the material and spiritual elements of everyday life for many indigenous peoples throughout the West Coast of BC and the Southern interior; particularly the Straits Salish, Hulkemel'em and Ditidaht Peoples, as well as others throughout the North-West coast. Cedar wood, bark, roots and leaves are all used in a number of ways: its wood is soft but durable, easy to split, and a naturally occurring fungicide called thugaplicin protects the wood from rot and fungal infections despite its moist damp climatic environment. Coastal First Nations used inner cedar bark pummeled with rocks to break down the fibres, making pieces of clothing, while strips of the bark and roots were used to weave mats, blankets and baskets. Sometimes cedar bark is dyed using plants such as red alder to create designs in weaving projects. Finally, the hard, inner cedar wood was used to construct houses, boxes, canoes, masks and totem poles. Because cedar was often regarded as a tree with key spiritual significance. Cedar was also used during ceremonies in sweat lodges as incense, due to its medicinal properties. Bark harvesting: Harvesting is carried out in late Spring or early Fall when sap is still running, making the bark easier to peel from the trunk as well as easier to split the pieces of inner bark from the soft outer bark. Florence Davidson, Kim Recalma Clutesi and Arlene Paul recounted that cedar should be harvested from trees that you can “hug”—indicating that medium aged trees are preferable. If the entire circumference of the trees’ bark is harvested, the tree will die. In order to harvest cedar’s bark while keeping the tree living, Coastal First Nations would only take a few strips from the base of each tree, leaving most of the bark still intact. Even so, the practice still introduces a greater risk of insect and fungal infestation to the tree at the site where the trunk lacks its tough, protective outer bark layer— indicating that an element of sacrifice is always inherent in the process of harvesting bark from the tree. Fiona Hamersley-Chambers. Personal Communication. 2016.